Johan Sebastian Bach, composer, violinist and keyboard virtuoso, was born on March 21, 1685 in Eisenach, Germany and died on July 28, 1750 in Leipzig, Germany. Today, he is probably the most famous composer of the Baroque Period in music (1600-1750) and definitely represents the culmination of Baroque style. One of the main differences between Baroque style and that of the Classical Period (1750-1825) which followed, was the use of counterpoint - literally note (i.e., point) against (counter) note (point). With 21st Century ears, we tend to hear music as a single melody, usually, the highest part, with (harmonic) accompaniment; however, much of his music consists of several melodies, all of equal importance, being played simultaneously. In Sonata No. 2 in Eb Major (BWV 1031), the Flute often has the melody, but it is not necessarily the melody (i.e., the left and/or right hand of the keyboard part may have an equally important melody). Bach is best known for his composition for keyboard, especially organ, and, because he was employed as a church musician, his religious works: the Mass in B Minor and Saint Matthew Passion are perennial favorites at Christmas and Easter, respectively. Bach composed for the Flute over a period of about twenty years, beginning with the Sonata in A Minor (BWV 1013) for unaccompanied Flute - BWV stands for Bach Werke Verzeichnis - Bach works catalog). This sonata was written while Bach was the conductor of the court orchestra in Cöthen, between 1717 and 1723, for the French flautist Pierre-Gabriel Buffardin (1690-1768), who Bach had met at the Dresden court in 1717; Sonata No. 1 in B Minor (BWV 1030) was also probably written for Buffardin. One of the two surviving manuscript copies of Sonata No. 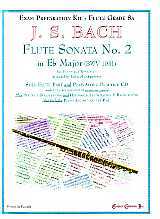 2 in Eb Major (BWV 1031) was copied by Carl Philipp Emanuel Bach (1714-1788) - Bach’s second oldest son, also a composer, who himself wrote many works for the Flute; this has caused much debate about the authenticity of this sonata and, for the same reason, Sonata No. 4 in C Major (BWV 1033), now believed to have been originally composed for unaccompanied Flute by J. S. Bach with a figured bass line added later by C. P. E. Bach. Were these works by Johan Sebastian or Carl Philipp Emanuel? Either way, they are Bach Flute Sonatas! To avoid the use of 16th and 32nd notes and, thus make the piece appear less intimidating, in the second movement of this arrangement (“Siciliano”) all of the rhythmic values have been doubled and the meter changed to 3/4 .